In the middle of each galaxy is a bright center, which is a condensed star cluster. Galaxies are typically held together by a black hole in the middle, keeping all of the stars within its gravitational pull. The arms of the galaxies are filled with sun-like stars which you can see in the Sombrero Galaxy or Milky Way. Here’s what’s fascinating to me: the bright center of the universe (according to the model) is like the star cluster of a galaxy, and galaxies are like the stars in the arms of the universe. 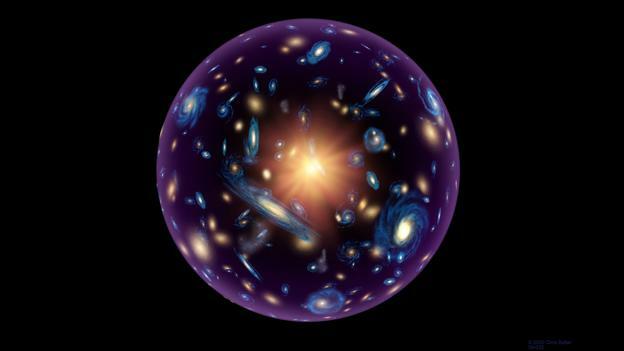 The universe is like a gigantic galaxy, and there are probably billions of universes out there, creating a mind-bogglingly huge multiverse. Does that make sense, or am I just crazy? All this to say: Where are our alien friends? It seems increasingly obvious to me that all matter has the same basic atomic structure, and the true infinity we do not yet understand is what happens when, if ever, we take off the lid to discover the very smallest Russian doll. We are electrons around a nucleus, a particle which in its turn is part of yet another electron. We fail to see this only because of the scale which is immense to us. One day its meaning will become clear. I would like to think that the meaning will be in this lifetime, but I highly doubt it. Perhaps in my next life, whichever form that may take, will hold more answers than questions.